Producers James Wan (The Conjuring) and Roy Lee (It) want to take author Stephen King’s 1987 sci-fi/horror novel The Tommyknockers to the big screen. THR reports the two will team up with Larry Sanitsky, who executive produced the 1993 miniseries adaptation which starred Jimmy Smits and Marg Helgenberger. The Tommyknockers is set in the small town of Haven, Maine (a frequent setting for King’s stories), where during a walk one of the residents stumbles upon a metallic object stuck in the ground. It turns out that the object is in fact a buried UFO which begins emanating an invisible gas. The gas gives inhabitants of Haven enhanced intelligence to begin building things, but don’t really understand what they are doing, and appear to be controlled by the spacecraft. The 1993 miniseries was successful for ABC. NBC announced development of a remake in 2013, but no mention of it was made after the announcement. 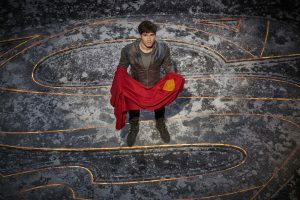 SYFY’s untold Superman series Krypton, premiered to an audience of over 2.6 million people in the Live+3 ratings, the best new series premiere on the network since Ascension in 2014. Krypton debuted on March 21 and was the #1 entertainment program on cable for the night. The show was the #1 entertainment program on cable in total viewers on its premiere night, beating Riverdale in all key demos, and was the best cable genre series premiere in key 18-49 demo since Legion on 2/8/17. Set 200 years before the destruction of Superman’s home planet, Krypton follows Seg-El (Cameron Cuffe), the legendary Man of Steel’s grandfather, as a young man who is faced with a life and death conflict – save his home planet or let it be destroyed in order to restore the fate of his future grandson. He must redeem his family’s honor and protect the ones he loves while being challenged by familiar DC characters Brainiac (Blake Ritson) and Earthly time-traveler Adam Strange (Shaun Sipos). Krypton is from Warner Horizon Scripted Television and is executive produced by David S. Goyer (Man of Steel) through his Phantom Four banner, alongside Cameron Welsh, who serves as showrunner. In addition to Cuffe, Sipos and Ritson, the show also stars Georgina Campbell (Black Mirror), Elliot Cowan (Da Vinci’s Demons), Ann Ogbomo (World War Z), Rasmus Hardiker (Your Highness), Wallis Day (Will), Aaron Pierre (Tennison) and Ian McElhinney (Game of Thrones). Based on the DC characters created by Jerry Siegel and Joe Shuster. SYFY’s jump into the DC universe takes a jump back in time to explore not really the origin story of its most famous superhero, but of his ancestors instead. An ambitious move, to eschew the draw of having a well known character to revolve around, instead developing a backstory for the world he ultimately came from. We know the planet Krypton explodes, and we know Jor-El sends his only son Kal-El to Earth just before that, where he grows up to become Superman. But this isn’t about that exactly – we’ve seen that in a few different versions of the Superman mythos. Instead, we are set a couple generations before those events, focusing instead on Kal-El’s grandfather, Seg (Cameron Cuffe), in his younger days. Seg’s own grandfather, Val-El, is declared a heretic and banished to the Phantom Zone, leaving the House of El disgraced and nameless. Seg becomes one of the Rankless – the lowest class of Kryptonians. He gets the chance to rejoin the ranks, but learns about his grandfather and what may happen after an Earth man from the future named Adam Strange (another DC comics character, played by Shaun Sipos), warns that someone is coming to change the course of history to prevent Superman from being born. The show is set in the domed city of Kandor, the capital city of Krypton and one of nine city-states that exist in the remaining inhabitable areas of the planet after a previous catastrophe. In recent years, the democratic government has been overthrown by a theocratic form that revolves around the worship of the sun god Rao, who is embodied by the Voice of Rao, a mysterious figure who wears a six-faced golden mask. All other religions have been banned. Several guilds exist to maintain the functioning government and the members live the “high life”, literally, while the Rankless occupy the streets. Indiana Jones 5 to start filming in April 2019! We finally see the return of Indy! Steven Spielberg, on hand at the Rakuten TV Empire Awards to receive a special award for his enormous body of work, also dropped word that the long awaited Indiana Jones 5 will begin filming in the UK next April!